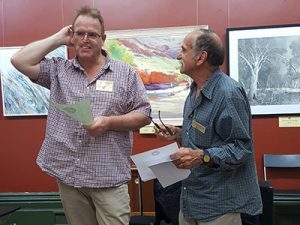 The People’s Choice prize is awarded to the artist who received the most votes from exhibition attendees. This year the prize was won by Andrew MacGowan. Here is Jack Condous, OAM, FRSASA, awarding the prize of $4,000 worth of solar products from Natural Technology Systems, to Andrew. 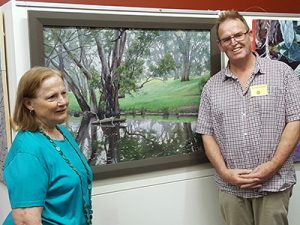 And here is Andrew with Winter Silent Beauty – no, that is not the woman beside him, that is Pip Fletcher who curates and donates the prize. Winter Silent Beauty is the oil painting behind them.